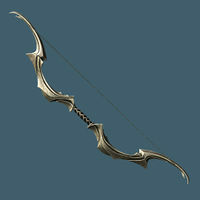 With the Unofficial Skyrim Patch, Auriel's Bow counts as a Daedric artifact for the Oblivion Walker achievement, despite the fact that it is an Aedric, not Daedric, artifact, and is therefore tied to the plane of Aetherius, rather than the planes of Oblivion. Its critical value is set to 13 damage, equal to its base damage, rather than 6 as would be expected. 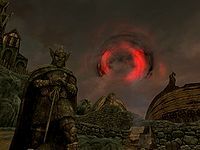 Shooting Sunhallowed arrows at the sun may cause it to become dark like the bloodcursed arrows.